Do You Have a Large Selection? If you’re searching for just the right vintage-inspired cage veil, dramatic bridal hair band, classic bridal tiara, glittering crystal comb, or stunning bridal jewelry, we at Bridal Styles Boutique invite you to visit our showroom! 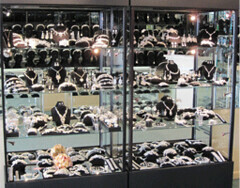 With over 450 bridal headpiece samples of every style on display alone, you can just imagine our selection! Not to mention the classic and embroidered bridal veiling, beautiful crystal and cubic zirconium jewelry, and other bridal accessories! We offer the largest collection of national and international bridal accessory designers, in addition to representing private designers exclusive to Bridal Styles. 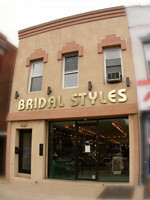 We specialize in finding the perfect finish to your wedding day look. During your visit, you’ll work one on one with a member of our team of stylists. Together, we’ll comb through our vast selection of veils, jewelry, headpieces, garters, ring pillows, and more to find just what you’re looking for. If you still can’t find the right finishing touches, working with our in-house designers, we can create a custom design to flawlessly suit your style. This entry was posted on Tuesday, July 27th, 2010 at 8:51 am	and is filed under FAQ's. You can follow any responses to this entry through the RSS 2.0 feed. Both comments and pings are currently closed.